Yes the Australians celebrate the english Queens official birthday on 8 June as a public holiday so we had a long weekend here. It was beautiful sunny weather and 22C so fine for winter so on the way back from flying I took a drive up Mount Tambourine which is a local beatyspot with fantastic views across the Gold Coast Hinterland. The plateau is an irregular shape, about 8 kilometers long and about 5 kilometers across at its widest part. 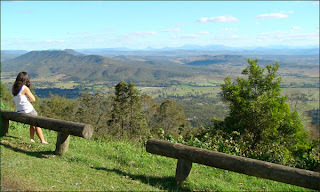 The highest point on Tamborine Mountain is about 600 metres above sea level. Geologically it is only 20 million years old. Geologists say that it was formed by the ancient shield volcano directly to the south. The landward remains of this immense crater can be clearly seen from the air and from a number of vantage points in the Border Ranges. This is what is so nice gliding here you get to see these fantastic views. Mount Warning, so named by Captain Cook as he sailed up the east coast of Australia in 1770, is just a small volcanic plug near the centre of the crater. 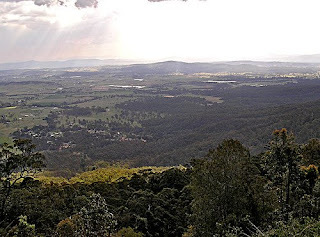 Tamborine Mountain plateau looks down on the surrounding lowlands, across the Nerang and Coomera River valleys to the Gold Coast and Pacific Ocean to the east and over the beautiful Albert River valley and right out to the Great Dividing Range to the west.